رائف, محمد, رزاقی کاشانی, مهدی. (1396). تراوایی نانوکامپوزیت‌های لاستیکی پرشده با نانوصفحات گرافن. 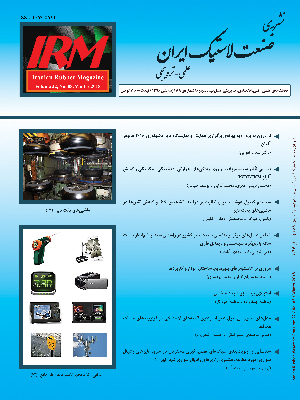 صنعت لاستیک ایران, 21(86), 21-30. محمد رائف; مهدی رزاقی کاشانی. "تراوایی نانوکامپوزیت‌های لاستیکی پرشده با نانوصفحات گرافن". صنعت لاستیک ایران, 21, 86, 1396, 21-30. رائف, محمد, رزاقی کاشانی, مهدی. (1396). 'تراوایی نانوکامپوزیت‌های لاستیکی پرشده با نانوصفحات گرافن', صنعت لاستیک ایران, 21(86), pp. 21-30. رائف, محمد, رزاقی کاشانی, مهدی. تراوایی نانوکامپوزیت‌های لاستیکی پرشده با نانوصفحات گرافن. صنعت لاستیک ایران, 1396; 21(86): 21-30. با توجه به ویژگی‌های مکانیکی، حرارتی، الکتریکی و سدگری فوق‌العاده، گرافن در بسیاری از صنایع مختلف از جمله صنایع بسته‌بندی و تایر که میزان تراوایی گاز در آن‌ها مهم است، استفاده می‌شود. از مسائل مهم در صنعت تایر، بهبود ناتراوایی هوا از تیوب‌داخلی است. چالش اصلی در این کاربرد، کاهش تراوایی گاز یا هواست که باید با استفاده از روش‌های ساخت، استفاده از نانوذره مناسب، اصلاح سطح آن‌ها و مهندسی فصل مشترک، آن را بهبود بخشید. لایه‌های گرافن با ایجاد مسیر پیچ‌درپیچ، مانعی برای مولکول‌های گاز شده و عبور گاز یا هوا را به تأخیر می‌اندازد و به‌شدت کاهش می‌دهد. در این مقاله‌ی مروری، تعدادی از تحقیقات تازه انجام شده روی نانوکامپوزیت‌های با بستر لاستیکی، با روش‌های ساخت مختلف و با کاربردهای مختلف، توضیح داده شده است. شرط لازم برای کاهش تراوایی مطلوب در نانوکامپوزیت، ایجاد پراکنش مناسب نانوذرات در بستر و ایجاد برهمکنش خوب با پلیمر است که می‌توان با روش‌های مختلف آن را بهینه کرد. در این مرور، مدل‌سازی تحلیلی برای تراوایی گاز از میان فیلم نانوکامپوزیت پرشده با گرافن با جزئیات ارائه شده است. 1. L.S.Schalder, P.V.Braun, P.M.Ajayan, Nano Composite science and technology, Chapter 2, Weinheim, Wiley, 2003. 2. D.R.Paul, L.M.Robeson, "Polymer nanotechnology: Nanocomposites," Polymer, pp. 3187-3204, 2008. 3. Y.Cui, S.I.Kundalwal, S.Kumar, "Gas barrier performance of graphene/polymer nanocomposites," carbon, vol. 98, pp. 313-333, 2016. 4. Z.Tang, L.Zhang, W.Feng, B.Guo, F.Liu, D.Jia, "Rational design of graphene surface chemistry for high performance rubber/graphene composites," Macromolecules, pp. 8863-8673, 2014. 5. K.K.Sadasivuni, D.Ponnamma, S.Thomas, Y.Grohens, "Evolution from graphite to graphene elastomer composites," Progress in polymer science, vol. 39, pp. 749-780, 2014. 6. T.Kuilla, S.Bhadra, D.Yao, N.H.Kim, S.Bose, J.H.Lee, "Recent advances in graphene based composites," Progress in polymer science, vol. 35, pp. 1350-1375, 2010. 7. B.Min Yoo, H.J.Shin, H.W.Yoon, H.B.Park, "graphene and graphene oxide and their uses in barrier polymers," applied polymer science, pp. 1-23, 2014. 8. D.G.Papageorgiu, I.A.Kinloch, R.J.Young, "elastomer/graphene nanocaomposites," carbon, vol. 95, pp. 460-484, 2015. 9. G.Choudalakis, A.D.Gotsis, "Permeability of polymer/clay nanocomposites: A review," European Polymer Journal, vol. 45, pp. 967-984, 2009. 10. S.Yaragalla, C.S.Chandran, N.Kalarikkal, R.H.Y.Subban, C.H.Chan, S.Thomas, "Effect of reinforcement on the barrier and dielectric properties of epoxidized natural rubber-graphene nanocomposites," Polymer engineering and science, pp. 2439-2447, 2015. 11. B.Ozbas, C.D.O'Neill, R.A.Register, I.A.Aksay, R.K.Prad'homme, D.H.Adamson, "Multifunctional elastomer nanocomposites with functionalized graphene single sheets," Journal of polymer science part B: Polymer physics, vol. 50, pp. 910-916, 2012. 12- م.صالحی، "مطالعه‌ی تأثیر نانوذرات خاک رس (مونتموریلونیت) بر خواص اصطکاکی، سایشی و اتلافی بر مبنای لاستیک استایرن بوتادی ان با دو روش اختلاط مذاب و لاتکس," پایان نامه‌ی کارشناسی ارشد، 1388. 13. A.Das, A.Leuteritz, P.Kavimani Nagar, K.W.Stöckelhuber, R.Jurk, G.Heinrich, "Improved gas barrier properties of composites based on ionic liquid integrated graphene nanoplatelets and bromobutyl rubber," Gummi Fasern Kunststoffe, vol. 69, no. 3, pp. 170-176, 2016. 14. G.Scherillo, M.Lavorgna, G.G.Buonocore, Y.H.Zhan, H.S.Xia, G.Mensitieri, L.Ambrosio, "Tailoring assembly of reduced graphene oxide nanosheets to control gas barrier properties of natural rubber nanocomposites," ACS: Applied materials & Interfaces, vol. 6, pp. 2230-2234, 2014. 15. J.Wu, G.Huang, H.Li, S.Wu, Y.Liu, J.Zheng, "Enhanced mechanical and gas barrier properties of rubber nanocomposites with surface functionalized graphene oxide at low content," Polymer, vol. 54, pp. 1930-1937, 2013. 16. R.K.Prad'Homme, B.Ozbas, I.A.Aksay, R.A.Register, D.H.Adamson, "Functional graphene rubber nanocomposites", Patent, US77445528B2. pp. 1-80, The Trustees of Princeton University, 2010. 17. H.Kang, K.Zuo, Z.Wang, L.Zhang, L.Liu, B.Guo, "using a green method to develop graphene oxide/elastomers nanocomposites with combination of high barrier and mechanical performance," Composites science and technology, vol. 92, pp. 1-8, 2014. 18. Y.Lin, S.Liu, J.Peng, L.Liu "Constructing a segregated graphene network in rubber composites towards improved electrically conductive and barrier properties," Composites science and technology, vol. 131, pp. 40-47, 2016. 19. M.Kotal, S.S Banerjee, A.K.Bhowmick, "Functionalized graphene with polymer as unique strategy in tailoring the properties of bromobutyl rubber nanocomposites," Polymer, vol. 82, pp. 121-132, 2016. 20. N.Yan, G.Buonocore, M.Lavorgna, S.Kaciulis, S.K.Balijepalli, Y.Zhan, H.Xia, L.Ambrosio, "The role of reduced graphene oxide on chemical, mechanical and barrier properties of natural rubber," Composites Science and Technology, vol. 102, pp. 74-81, 2014. 21. S.Schopp, R.Thomann, K.Ratzch, S.Kerling, V.Alstadt, R.Mulhauot, "Functionalized Graphene and Carbon Materials as Components of Styrene-Butadiene Rubber Nanocomposites Prepared by Aqueous Dispersion Blending," Macromolecular Materials and Engineering, vol. 299, pp. 319-329, 2013. 22. S.H.Song, J.M.Kim, K.H.Park, D.J.Lee, O-Seok Kwon, J.Kim, H.Yoon, X.Chen, "High Performance Graphene Embedded Rubber Composites," RSC Adv., vol. 5, pp. 81707-81712, 2015. 23. W.Xing, M.Tang, J.Wu, G.Huang, H.Li, Z.Lei, X.Fu, Hengyi Lei, "Multifunctional properties of graphene/rubber nanocomposites fabricated by a modified latex compounding method," Compositess Science and Technology, vol. 99, pp. 67-74, 2014.1. L.S.Schalder, P.V.Braun, P.M.Ajayan, Nano Composite science and technology, Chapter 2, Weinheim, Wiley, 2003. 23. W.Xing, M.Tang, J.Wu, G.Huang, H.Li, Z.Lei, X.Fu, Hengyi Lei, "Multifunctional properties of graphene/rubber nanocomposites fabricated by a modified latex compounding method," Compositess Science and Technology, vol. 99, pp. 67-74, 2014.